Last day for refund... 100%: Jan 10, 70%: Jan 17, 40%: Jan 24, 20%: Jan 31. 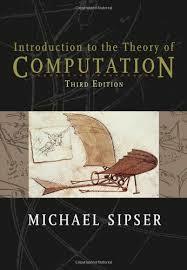 Introduction to the Theory of Computation (third edition), Michael Sipser, Publisher: Cengage Learning, 2012, ISBN-10: 113318779X, ISBN-13: 978-1133187790. Students should have previously encountered many of the topics we will cover. Chapter 0 of the Sipser textbook sets the stage by providing background, prerequisite information that you should already know. We will not cover this chapter, but please read it before the first class as a refresher and to make sure you are ready for this material. It is the student's responsibility to ensure that he/she has the appropriate background before attempting this class. Your grade will be based approximately, as follows. These percentages are tentative and subject to change. I want all students to focus on learning as much as they can from this class and not to stress out over grades. That said, grades will be based on a point system. At the end of the term, your points will be added together and then all the students will be placed in rank order, from the top-scoring student to the lowest-scoring student. The final letter grades will be based on each student's place in the rank order. At the beginning of this course, each student will be assigned a 4 digit "code number". This number is for this class only and has nothing to do with your PSU ID number. Midway through the term, I will post a "grades-so-far" chart, showing the rank ordering and allowing students to see how they are doing relative to the rest of the class. Using this number, you will be able to locate your individual scores while remaining anonymous to other students. The grading procedures and point system are described in more detail here. Attendance in class is mandatory. Successful students will arrive on-time, relaxed and full of curiosity. Attendance will be checked regularly and may count for part of your grade, especially if you miss more than a couple of classes. In case you miss a class (e.g., for serious illness or emergency), you should watch the video on the material that was covered. I encourage students to freely discuss the material in this class. You may also use the class mailing list to post questions, comments, etc. You should not post solutions to homework problems. You must compose and write all homework and exam answers individually, with no assistance. You may not copy, plagiarize, or otherwise cheat. The exams may test on material covered only in class or on material covered only in the reading assignments. You must both read the material and attend classes. Exams will be closed-book, closed notes, no calculators. The Final Exam will be comprehensive, which means it will cover material from all parts of the class. Incompletes will not be given. www.pdx.edu (The PSU home page). Other Cancellations: If I should need to cancel class for any reason, I will email the class mailing list. A "MailMan" e-mailing list will be maintained for this class. From time to time I may post notices about the class and hints/comments about assignments. Students are encouraged to send mail to the list, too. All students should subscribe to this list. Go to the following web page and enter your email address and a password and click "subscribe". The MailMan program will email you a confirmation message. You must reply, but you can simply hit your email "reply" button. After being adding to the mailing list you will get a "welcome" message from me.